Getting a medical marijuana card in Florida is a fairly streamlined process, but it can still be confusing. The team at Access Marijuana RX is here to help. Our receptionists and staff who answer our phones are very knowledgeable about the process, so give us a call if you have any questions whatsoever: 727-209-5470. Proof of Florida residency and photo I.D. You can't visit just any doctor for this appointment. They must be registered with the state's cannabis program. All of our physicians have completed the state-mandated training and certification. You don't need to be referred by your primary care doctor or anyone else. Simply give us a call! You will receive a patient registry I.D. number from us, if our doctors determine you are eligible. You will use this I.D. number to complete an online application on the state's website. This application is how you register for a medical marijuana card. At the same time, our doctors will add you to Florida's Medical Marijuana Use Registry. This listing will include your patient I.D. number, your name, your treatment recommendation and other identifying data. After you've completed your online application with the patient registry I.D. number we provide, all that's left to do is wait for the state to authorize and activate your application. This can take 2-3 weeks. You will receive an email from the state when the listing is activated. Once you receive this email, you can purchase marijuana in Florida! Don't wait for the physical card you'll get in the mail, which could take another 2-3 months. Print out the email or download it on your phone. Take your regular photo I.D. to the dispensary of your choice, and the staff there will be able to look up your active listing in the state's database. You'll be able to purchase the dispensary's products during this visit, no physical marijuana I.D. card required! "Can I grow marijuana after I get my card?" No, Florida law does not currently allow residents to grow their own marijuana plants. Only the licensed dispensing centers are permitted to do so. At AMRX, our doctors keep in touch with our patients and are committed to ongoing communication. Our care doesn't stop after you've received your card; in fact, we want to hear from you after you've had a chance to use your medication. Our doctors will want to know how you are responding to the dose and type of marijuana you purchased. That way, we can work with you to adjust any aspects of the medication that aren't working as best they can. The $225 consultation fee is waived IF our doctors determine you do not qualify for marijuana in Florida. So there's no risk in finding out. As you shop around for doctors, we hope you'll keep the following in mind: At AMRX, our doctors and our entire staff are personally committed to real guidance and care. We won't leave you out in the cold as you try to figure out how to complete your application; we'll help you with each step. We encourage and request that our patients follow up with us after they've obtained their medication because we want to make sure it is working as well as possible. And we will make sure you find a dispensing organization you like and that serves your needs. Our doctors have a thorough understanding of the types of marijuana products available, and which devices and strains may be the best experience for you. In summary, we are here for our patients when they need us. Florida dispensaries are known as Medical Marijuana Treatment Centers (MMTCs). Under Florida law, MMTCs are allowed to grow, cultivate, manufacture and sell their own marijuana and marijuana products. Therefore, each dispensary has its own brand and array of products. You will see different items depending on the MMTC you choose. At AMRX, our doctors want you to have the best possible experience from this herbal therapy. That's why we help you choose an MMTC. We are familiar with the types of products each dispensary provides in our area. Rely on us to let you know which center is likely to carry the right medication for your ailment. Not only will the array of medication vary by MMTC, so too will the prices. You can choose any product or combination you like, as long as they don't violate any exceptions in your treatment recommendation. You can purchase any amount you like as long as that amount doesn't exceed the 70-day allotment of medication you are allowed at once. You may choose any state-licensed MMTC. Many of these centers offer free delivery of medication to your door, if that is something you are interested in. "Can I take my medication to another state?" No, Florida marijuana patients may use and possess their medication in our state only. You can face criminal charges for taking your medication over state lines, even if the other state has its own medical or recreational marijuana laws. Your registration with a medical marijuana card is not indefinite. A certification period lasts 210 days, so you must come back to our practice for a face-to-face evaluation every 210 days in order to keep your marijuana listing active. You will also see that your marijuana card is valid for 12 months and has an expiration date. Take a look at the date when you receive your card and make a calendar reminder to schedule an appointment with us 30-60 days before your card expires. That way, you won't experience a lapse in medication. You will need to pay the $75 state registration fee each time you renew, plus our fees. This will ensure you continue to get the benefits of your medication without interruption. 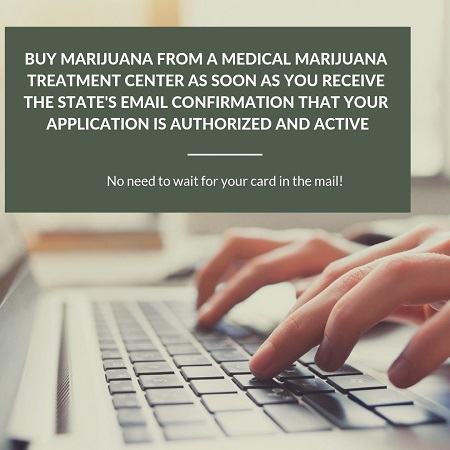 To find out if you are eligible for a Florida medical marijuana card, please arrange your in-person evaluation at our office by calling our friendly staff at 727-209-5470. Our elegant, comfortable St. Petersburg office is located across from the Bayfront Medical Center in a professional medical complex. We are proud to care for people from across our region of Florida, including Tampa and Orlando.